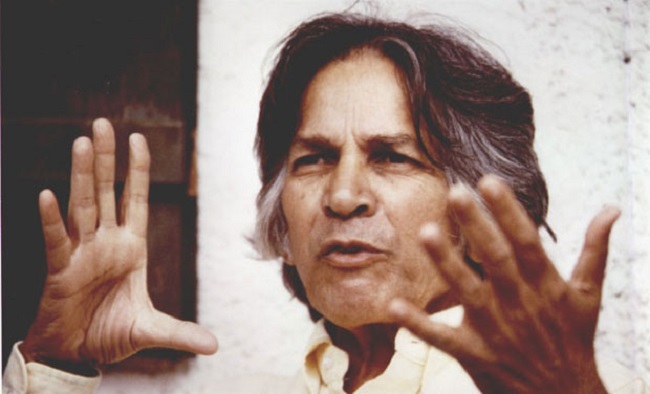 U.G Krishnamurti, an enigma - a person who defies all classifications - a philosopher, a Non-guru guru, call him as you wish. Once you have read even a few words of his, your understanding will never be the same. What am I actually searching? - You search The Natural State. It is a state of great sensitivity - but this is a physical sensitivity of the senses, not some kind of emotional compassion or tenderness for others. There is compassion only in the sense that there are no 'others' for me, and so there is no separation. Whether you are interested in Moksha, Liberation, Freedom, Transformation, you name it, or you are interested in happiness without one moment of unhappiness, pleasure without pain, it is the same thing. What I need to get that sensitivity? Knowledge? -The knowledge creates the experience, and the experience strengthens knowledge. This is a vicious circle. The questioner is nothing but the answers. That is really the problem. We are not ready to accept this answer because it will put an end to the answers which we have accepted for ages as the real answers. Anything you experience based on knowledge is an illusion. Is there Truth after all? - There is no such thing as truth. The only thing that is actually there is your 'logically' ascertained premise, which you call truth. The body does not exist except as a thought. There is one thought. Everything exists in relation to that one thought. That thought is 'me'. Anything you experience based on thought is the illusion. I see... I am not ready yet? - You are not ready to accept the fact that you have to give up. A complete and total surrender. It is a state of hopelessness which says that there is no way out... Any movement in any direction, on any dimension, at any level, is taking you away from yourself... Only if you reject all the other paths can you discover your own path? Food, clothing, and shelter- these are the basic needs. Beyond that, if you want anything, it is the beginning of self-deception. Be selfish and stay selfish' is my message. Wanting enlightenment is selfishness. Charity is selfishness. What about the world? Can I change it for the better? There seems to be no way out? - You have to be saved from the very idea that you have to be saved. You must be saved from the saviors, redeemed from the redeemers. When you know nothing, you say a lot. When you know something, there is nothing to say. You have to touch life at a point where nobody has touched it before.Nobody can teach you that. I am always emphasizing that somehow the truth has to dawn upon you that there is nothing to understand. - What I am trying to say is that there is no individual there at all. There is only a certain gathering of knowledge--which is thought - but no individuality there. You mistakenly believe that by pursuing the spiritual goal you will somehow miraculously make your material goals simple and manageable. We are not created for any grander purpose than the ants that are there or the flies that are hovering around us or the mosquitoes that are sucking our blood. - It is fear that makes you believe that you are living and that you will be dead. What we do not want is the fear to come to an end. That is why we have invented all these new minds, new sciences, new talks, therapies, choiceless awareness and various other gimmicks. - Boredom is a bottomless pit. As long as you think that there is something more interesting, more purposeful, more meaningful to do than what you are actually doing, you have no way of freeing yourself from boredom. - You forget that everything you have around you is the creation of thought. You are yourself born out of thought, otherwise, you would not be here at all. In that sense, the thought has a tremendous value, yet it is the very thing that will destroy you.